Townie. That’s the word that comes to mind whenever we think of George’s. Know what we mean? Every town has at least one spot that is a no-frills, solid, dependable restaurant frequented at any given time by dozens of locals, the townies who gather ’round the pie case like it’s a watering hole. If you’re lucky, the townie places also happen to have good food. Some towns have to make do with what they can get. The townie spots are there by tradition alone, where people just have to put up with the sort of food that gets served there. We always feel a little sorry for those towns. Thank goodness Fort Smith has George’s. It’s a townie spot we’ve even been known to take the occasional visitor. Not someone who’s looking for elegance or exotic food or for a touristy experience. Hard Rock Cafe Fort Smith this ain’t. But someone who wants to have a good conversation over a great American meal without worrying about all the other stuff will get George’s. 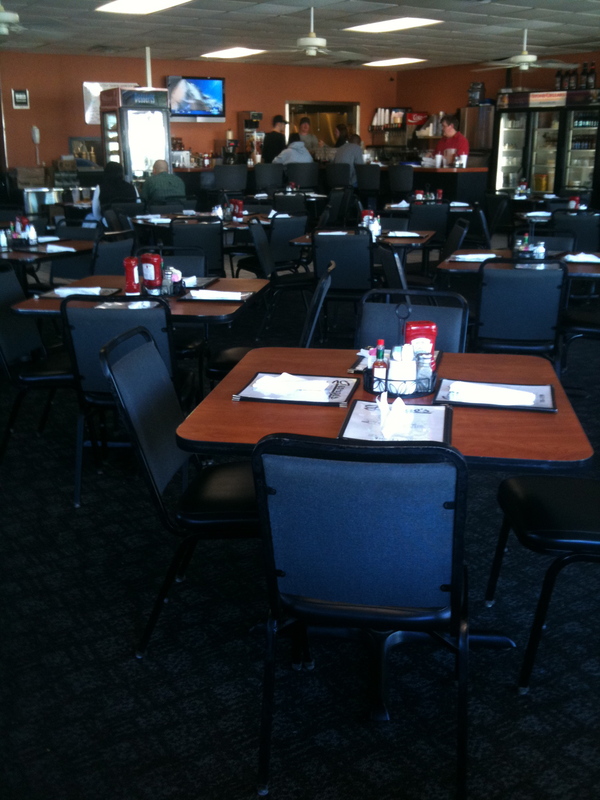 The restaurant is reliably clean and neat with food that is simple, tasty and filling. Oh, and affordable. And a constant, reliable menu. Is it such a mystery this place does a good business? We took this picture because it is, for the record, the emptiest we’ve ever seen George’s large dining room. We’re not sure how many people fit in the restaurant, but it’s a bunch and they’re usually at least half full. Read on and find out the reasons for that.